This anthology actually comes at a very appropriate time, with a lot of discussion happening at the moment about women in science fiction and fantasy, the problems facing female authors, and representation of women on the nomination lists for major genre awards. On a more personal level, I recently tried to put together a list of favourite characters in science fiction books and found that not only did I struggle to think of enough, but there were no female characters even close to making the list. A bit disturbed by that, I switched to a list of fantasy characters instead, and quickly compiled an all-female top ten without even really trying. I was therefore very excited to read this anthology! This collection’s specific purpose is to draw together stories about women, real women as opposed to the caricatures and stereotypes that often pop up in science fiction. The characters in this anthology are not necessarily good women or even ‘strong’ women, but real people who are intellectually and emotionally equal to men, and whose stories are just as powerful and important. The editor, Athena Andreadis, explains in her introduction that what we won’t find in this collection are “wicked stepmothers, statements like “This is a man’s job,” or “Aren’t you shortchanging your children?” You won’t find wasp-waisted turbo-breasted courtesans or women with obedience spliced into their DNA... You won’t find alpha males – who, incidentally don’t exist biologically in humans”. The Other Half of the Sky is an anthology that gathers great female characters of all varieties, from all kinds of writers (and male authors as well as women). The table of contents reveals a fantastic line up of authors, and the stories really don’t disappoint. This is the strongest collection of short stories that I’ve read yet, and not just as feminist tales or science fiction focussing on women, but as stories full-stop. The range of ideas and different tones and styles is astonishing, some of it familiar but told engagingly, much that is new and original, some with the exciting feel of an adventure story, some powerful and moving, some enchanting, and some that I found very challenging. There really is something here for everyone. Occasionally I found that the characters themselves were overshadowed by the ideas and worlds of the stories, which was a bit of a shame considering the aim of the collection. 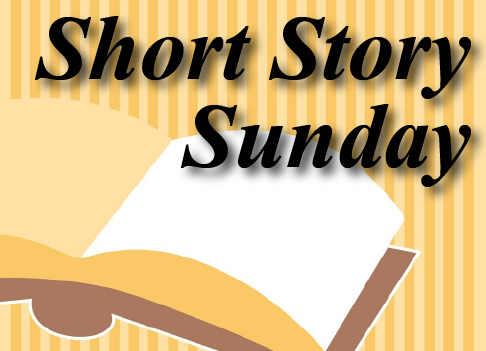 There were also one or two stories that felt like they ended a bit abruptly, or that could perhaps have done with a novella or longer book to explore their ideas more fully. These were just small points, however, and the incredible strength of the collection, and of the writing of all the stories really does shine. The stories also work very well together; the editor and co-editor have done an excellent job of finding stories that complement and challenge each other. I would recommend that readers go through in order, rather than dipping in and out. One of the biggest strengths of the collection is that it doesn’t just show us ‘the other half of the sky’ as far as women are concerned, but in other ways too. Many of the stories gathered here offer glimpses of a future in which the dominant culture is not Western, in which sexuality and gender identity are varied and accepted, and in which the language and tropes of alien contact stories do not have to reflect the colonialism of the past. Every single story, even those that play with familiar territory and ideas, offers something a little new. Many of the stories manage to be a lot of fun while also leaving the reader with plenty to think about. 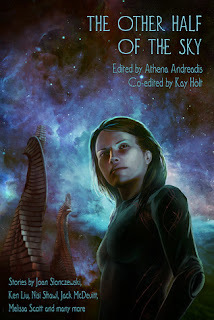 It would also be a mistake to overlook Athena Andreadis’ introductory essay, which lays out some of the problems with the genre but at the same time shows a deep love for science fiction. Her ideas are well argued and her comments on the selected stories and authors are both interesting and a great starting place to find other work by these writers. One of the reasons I love anthologies is that they help me to discover new writers that I might otherwise have missed, and this collection certainly fulfils that. I was already familiar with a few of these authors, but I will certainly be searching out more fiction from all of them. Sailing the Antarsa, by Vandana Singh. An extraordinary and enchanting story – science fiction with a folkloric or mythical feel. My favourite in the collection. The Waiting Stars, by Aliette de Bodard. I’ve loved Aliette’s writing for a while now, and this is another beautifully written and moving story from her. The Shape of Thought, by Ken Liu. A first contact story that examines language, sexuality and colonisation. An emotional and well-told story. Mimesis, by Martha Wells. I loved the creatures in this story and the descriptions of their world. Great characters and an exciting story. Exit, Interrupted, by C. W. Johnson. This is such a great concept, well paced and exciting, and it ends perfectly. Dagger and Mask, by Cat Rambo. This story had a really interesting approach, told from the point of view of the assassin sent to kill a ship’s captain, and yet really the story is about the captain. Another great ending. Thank you to Candlemark & Gleam and NetGalley for providing a review copy of this book in exchange for an honest review. Can we get a bigger picture of the cover? I think I recognize the figure on the cover! Really? I didn't realise it was based on anyone. If you click the image it will 'zoom in' on it for you, but that's the biggest I have I'm afraid. I don't think the figure is based on any particular person; you can see a larger version and read the artist's thoughts on its creation at The Book Smugglers, though! Thanks for the link Kate! :-) That's a really interesting post. And it is a great cover by the way!